“I worry day in and day out, with the amount of guns out there . . . that one of these officers [will] get hurt,” said police commissioner William B. Evans. As police investigated the city’s 23rd homicide of the year, the city’s police commissioner called on those gathered during a memorial service Sunday to pray for an end to the violence. 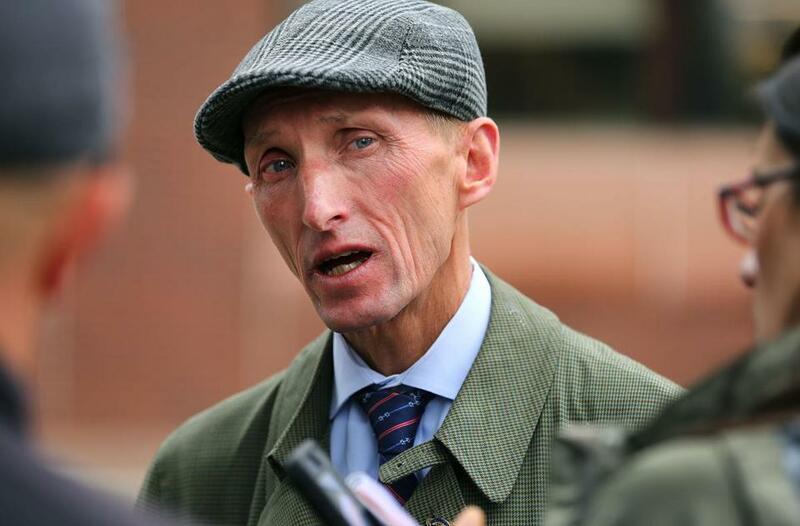 “Let’s pray for a peaceful summer,” Boston police Commissioner William Evans said during the Boston Police Relief Association’s annual Memorial Day Service, which honors department members who died in the past year. Evans’s plea came as police asked for the public’s help in solving a pair of homicides that happened June 1: the shooting death of a 29-year-old man whose body was found late Friday night in East Boston, and the fatal stabbing of a 58-year-old man in Mattapan that morning. “I think I’m the only guy who wakes up every day and hopes for [bad] weather,” Evans said in a moment of levity. On Friday night, police responded to a 911 call reporting shots fired in the area of 800 Border St. at 11:53 p.m., and officers from District 7 found the victim, who had suffered multiple gunshot wounds, Boston police said in a statement posted Saturday to the department’s website. Police did not identify the victim in the East Boston shooting Sunday afternoon. And also on Friday, Jocelin Nordeus, 58, was fatally stabbed during an altercation near 535 River St. in Mattapan around 2:50 a.m., Boston police said. Police are asking for the public’s help in both cases. “Our homicide detectives . . . they really work hard, we have been closing a lot of cases. But it’s with the help of the public,” police Superintendent William Gross said Sunday. Anyone with information can contact Boston police anonymously at 1-800-494-TIPS or by texting the word ‘TIP’ to CRIME (27463), police said. During Sunday’s ceremony, Evans said he was proud of the work of Boston officers who have taken illegal guns off the street, but worried about the safety of police as they go about their jobs. The city has seen 23 homicides since Jan. 1 of this year, Evans said. That’s up from roughly the same period last year, when there were 16 homicides from Jan. 1, 2017, to May 27, 2017, according to police data. Evans pointed to the dangers officers face, including an officer-involved shooting on Westminster Street in Hyde Park on May 31, when John Mentor, 32, fired a gun at several people before turning his weapon at two uniformed police officers. Police shot Mentor, who did not suffer life-threatening injuries, police said in a statement Friday. Mentor was charged with two counts of assault with intent to murder, plus firearms charges, police said in a statement Friday. Evans asked those at Sunday’s service to pray for officers, but also to pray for the safety of the city’s young people, too. “I pray every night that none of [the city’s police] get hurt, but also I pray that these young kids aren’t getting killed in our city,” Evans said. Globe correspondent Lucas Phillips and Felicia Gans, Emily Sweeney, and Danny McDonald of the Globe staff contributed to this report. John Hilliard can be reached at john.hilliard@globe.com.